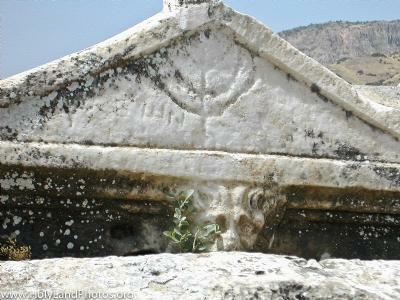 Although there are burials on several sides of Hierapolis, the necropolis (“city of the dead”) on the northwest side of the city is the most famous. It stretches north of the Domitian Gate for about 2 mi. [3 km.]. Archaeologists have surveyed the necropolis and have recorded over 1,200+ tombs. Some of them have been excavated. The types of burials include limestone sarcophagi, built up temple– or house–like tombs, and low circular tumuli. The burials in the necropolis extend from the Hellenistic to the Early Byzantine periods.